Mixed-age Classes: All of our classes are mixed-age, family style classes for children ranging in age from birth through age five. 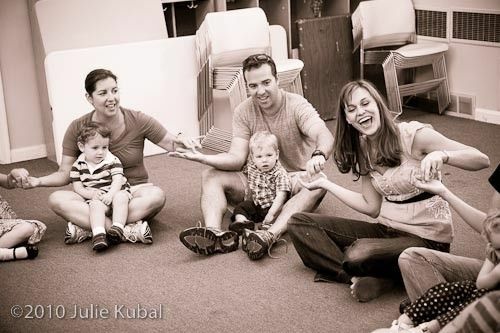 Every class has some babies, some toddlers, and some preschoolers, along with caregivers. Additional adult relatives (i.e. grandma, grandpa) are always encouraged to join us as well. Younger children enjoy watching and imitating older ones, older children delight in watching their younger counterparts, and adults can bring different age siblings to class together. Each child participates at his or her own level in singing, moving, chanting, listening, watching, and exploring musical instruments. Even our newborn music makers produce tones, shake their hands, tap their toes, wiggle, and absorb what others around them are singing and playing. The emphasis is upon creating a fun, informal, intergenerational musical experience powered by the caregiver/child dyad. Our mixed-age class follows the recommendations of early childhood development researchers who have found that grouping mixed-age children together fosters natural, family-style learning. Our classes are offered in 10 week semesters, each based upon one of the nine Music Together® song collections. Each Music Together collection is titled with the name of a different musical instrument, though it's songs are not limited to that instrument. Each collection provides a richly varied musical experience, including traditional American folk songs, world-music (i.e. multi-cultural) folk songs, and original Music-Together songs. The song collections are non-sequential. For each session we allow two make-ups. Please arrange make-ups prior to "dropping into" a class, as some our more crowded than others. We're taking registrations for the Spring 2019 classes now!